We offers mubaraki to the entire Jamat of USA on the special occasion of Mawlana Hazar Imam's Diamond Jubilee visit during month of March.. Date will b announced later on..
Mawlana Hazar Imam will conduct State work, Institutional and Jamati ceremonies (Baitul Khayal, Mahadan and Mehmani) and grant a Diamond Jubilee Darbar for the Jamat. We offer wishes for a successful visit and for the happiness of the Imam and the entire USA Jamat. Tentative date March 10 or 11 for Houston. Second city Atlanta. No Darbaar only Mulaqaat unless HI changes the program and "Kaam kaaj". Three day program in Houston for KK including Maadan ka Chanta and Isme Aazam and probably two days for mulaqaat for the huge Jamat. Venues are NRG and George R Brown convention center. Yes rodeo will still be going on but that will not affect us. No dinner and dandiya at either venues. Mubaraki!! Dates for MHI's visit were announced today. MHI arrives on 13th and mulaquat will be in Atlanta from 14-17 and 19-22 in Texas. Florida, Northeast, Southeast, Midwest and West regions will be going to Atlanta. Central, Southwest and neighboring regions will be going to Houston. The venue for the Miami Jamat has been changed to Houston. Mehmani date is the March 20th. The other 4 centers in Florida, that is, Orlando, Tampa, Ft Lauderdale and Ocala will be traveling to Atlanta as announced earlier and our mehmani date is the March 15th. For the benefit of the Jamat traveling to Mulaqat cities, airfare and car rental discounts have been negotiated with various U.S. airlines and car rental agencies. The Jamat is encouraged to research all travel options appropriate for their situation, and make reservations accordingly. Preparation to welcome H.H. 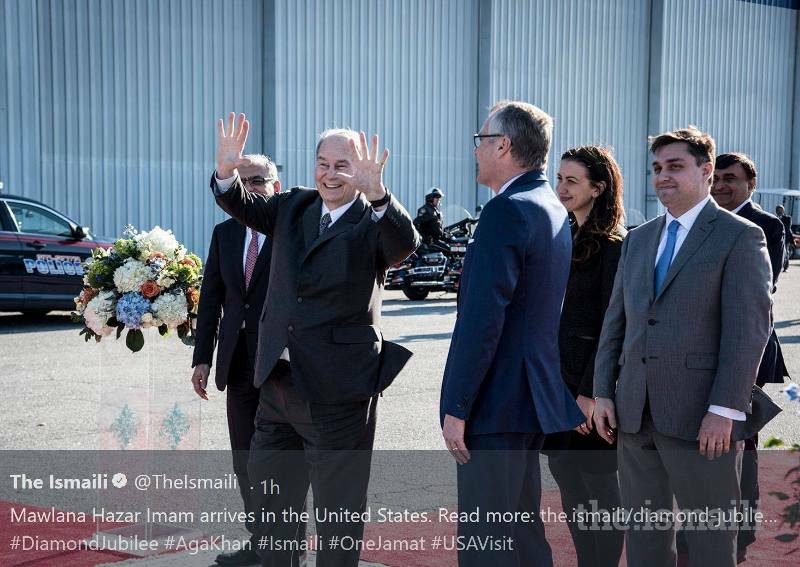 The Aga Khan in USA in March 2018 on the occasion of his Diamond Jubilee. H.H. The Aga Khan, Mowlana Hazar Imam, is expected to give Didar to his community soon in USA. Dates may switch a couple of days. What about the didar for California, Nevada and Arizona jamats? USA Diamond Jubilee visit programs of kam kaj. 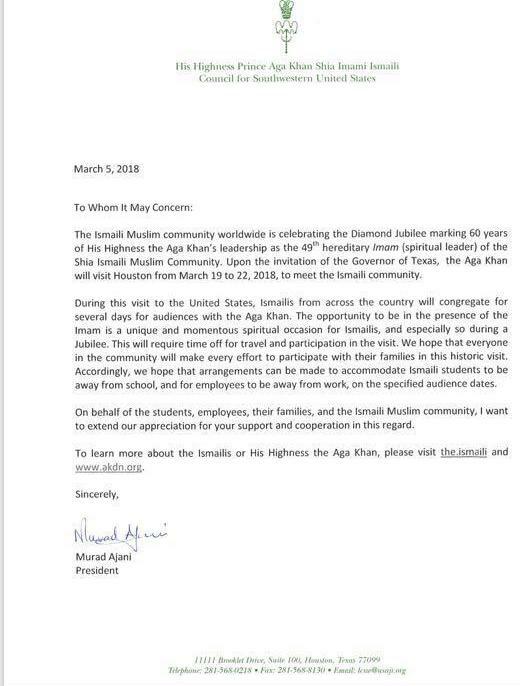 Mowlana Hazar Imam is expected in Atlanta around 6pm today for his Diamond Jubilee USA visit to met his community starting from March 14th in Atlanta and ending visit in Houston on March 22nd. 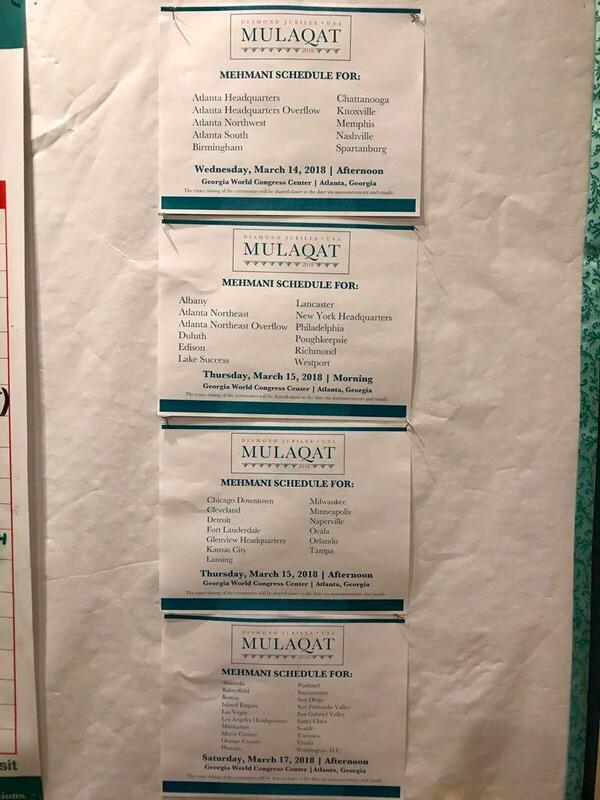 On Navroz 21March 2018, Mowlana Hazar Imam will give Mulaqats to his USA Jamat in Houston. Will Houston Ismaili Jamat make this the biggest Navroz & Jubilee celebrations of our time? Will bureaucracy overtake the voice of the heart? H.H. 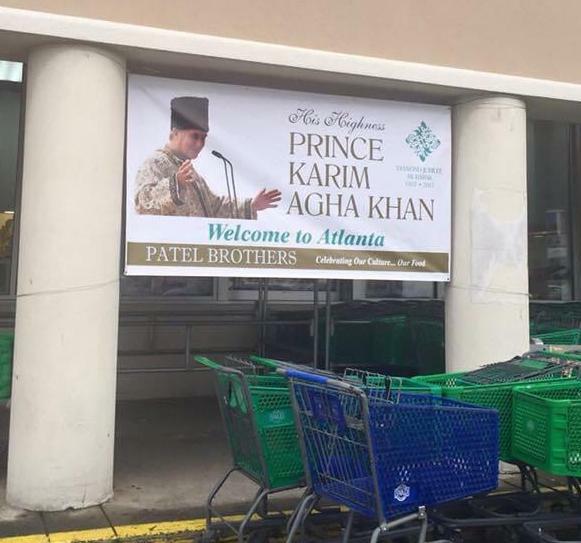 The Aga Khan arrived in Atlanta for the begining of his USA Diamond Jubilee visit on 13th of March 2018 around 6pm and was welcomed by Government leaders and Jamati leaders. Many Mubaraki to Texan Jamats we all have nice and memorable Didar in our lives..
MHI will with some ( not all) Ismaili jamats on Navroz day but as per my knowledge there is no special arrangement made for Navroz Day to make this historical visit memorable on Navroz day in Houston Texas. Over the last few days, volunteers have been ready at information and registration booths at the George R. Brown Convention Center to welcome Jamati members travelling to Houston for Mawlana Hazar Imam's historic visit. 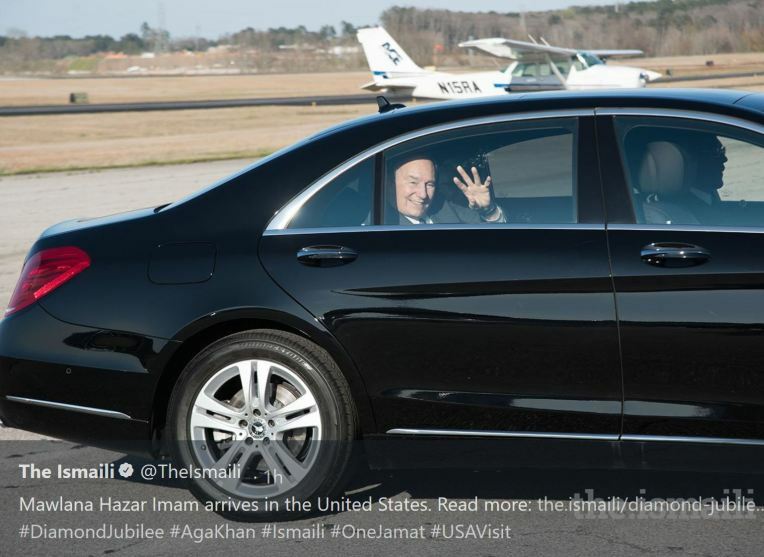 Over the last few weeks, the Jamat has enthusiastically attended special preparatory sessions for Hazar Imam’s Diamond Jubilee visit to the United States. Topics such as site orientation, educational seminars on the significance of Mulaqat and Mehmani, and what to expect on the special day were designed to equip the Jamat with resources they might need to ensure a memorable experience. “We had a lot of informational sessions, orientations, and trainings. The direction of all the volunteers was phenomenal. I had no trouble finding my way,” said Nasrullah Khimani of Little Rock, Arkansas. While the local Houston Jamat is quite large in numbers, thousands of Jamati members have travelled to the city via car, bus, and plane from all corners of the country. The Diamond Jubilee Call Center volunteers and hundreds of on-site Jamati volunteers have provided supplemental support for all Mulaqat-related concerns, and have served as a general information portal for visit-related questions. Asma Bhaidani, Operations Lead for the Diamond Jubilee Call Center in Houston, noted that the line became active in December and has taken over 18,000 calls to date. “While we did not necessarily have the answers to all the questions we received, our work gave us the opportunity to touch each individual struggling with any issue and escalate them to the Command Center which helped us get the answers,” said Bhaidani. “And I think our attention to each Jamati member has been impactful on the Jamati experience,” she added. In addition to the call center, hundreds, if not thousands of volunteers from areas such as transportation, hospitality, stage construction, and registration have been working around the clock to ensure a smooth experience for members of the Jamat during the USA Mulaqat. With Mawlana Hazar Imam’s visit, there is palpable excitement in the air; the Jamat is looking forward to seeing the Imam again in the United States after 10 years — or, like Aayan, for the very first time. Above is the signboard in Sugar Land, Texas near airport where MHI's plane was landed and departed. This signboard is flashing alternatively before MHI's visit in Houston, Texas but it has been not removed yet even after 2 days of MHI's departure. This photo has been taken by me on 3/25/2018 4.00 P.M. I am sorry that you can not open that photo. agakhani_78660@yahoo.com is my e-mail address I can forwarded that photo and I think it will easy for me since I do not know how to upload that photo in Ismaili.net. Sorry for any inconveneience you may have to face!